Word and Witness – That's the word, and I'm a witness. Any chickens out there? People afraid of pain, tight spaces, dogs, bodies of water, flying, moths–yes, moths–heights…? Everybody raise your hand because if I keep listing, I’m going to eventually get to the thing that chills you to the core. We live in a scary world: snakes, spiders (they’ve discovered a new species the size of footballs, y’all! http://www.telegraph.co.uk/news/2017/04/14/massive-spider-red-fangs-discovered-mexican-cave/amp/), tornados, terrorists. Most of us carry out some aspect of our daily lives in ways that help us avoid or at least minimize exposure to that which we fear, which is not always a bad thing. Sometimes our fears grow fangs and become phobias that make some day to day activities extra stressful, which can be a very bad thing. But worse still is when fears and phobias become our idols, become things we sacrifice our peace and power to. When those hideous little gods are allowed to rule and reign over every move, every decision, we become something dangerous and despicable ourselves: We become cowards. But the cowardly…Those three words used to frighten and confuse me. I didn’t understand why “the cowardly” are not only on the list of the so-called serious sinners to be consigned to a fiery second death, but are listed first. After a few decades of witnessing how cowardliness destroys everything from families to countries, I understand. By definition a coward is “a person who lacks courage in facing danger, difficulty, opposition, pain.” The word comes from the Latin cauda, meaning tail, as in not the head, as in bottom, backside, behind–with all the ensuing implications thereof. By practice a coward is a person who climbs out the back window rather than stand up to a bully at the door. They avoid even essential conflict, confrontation, discomfort, opposition, or difficulty. Their fight song is Take It Easy. A coward doesn’t just feel fear. The Greek word used for coward in the New Testament establishes the cowardly as those who are fear-driven, who lack the courage needed to follow Christ. Thus cowardliness paves the way for all other sin by regarding self and self-preservation as first and foremost. Cowards are often self-righteous, self-centered, even self-aggrandizing: They adopt any self-serving posture they must to keep conviction at bay. A coward assumes that feeling good–no matter how much hellishness is going on around him, and often because of him–is his right. He dreads feeling discomfort. Thus a coward will reject anyone who challenges him, anyone who even so much as hints that his attitude might (gasp) be wrong, anyone who points out that his decisions are shallow and self-serving, anyone who confronts his abdication of reason and responsibility. In fact, a coward only manages to display fierceness in his vehement and sometimes violent attacks on those who seek to separate him from his Precious. A coward will give in to whatever his selfish flesh desires to avoid feeling the burn of self-control. He mocks the forthright, the steady, the brave because he is threatened by them. He wants to know how he can attain complete peace, aka eternal life, but when he hears he has to give up everything he loves about himself and follow a God with a cross on his back, he slinks his way back to cowardly futility. Cowards can’t compromise. To do so would require them to deny self, and for the cowardly, self is king. So all relationships with cowards must be on their terms, making those in relationship with them slaves to the very things the coward is enslaved to. Every whim, every anxiety, every opinion, every change of mood must be not only endured but embraced by those who share his life in order to extend the illusion that the coward is in charge. Cowards are the ultimate control freaks. Cowards see disagreements as attacks. All conflicts, even necessary ones, are a threat to be silenced at any cost. Cowards hate truth and despise boundaries, while blithely tolerating injustice and brutality against others lest the attack be launched on them. Cowards bail when things get tough with no thought for those whom their desertion makes things even tougher. Cowards are the ultimate betrayers. Yeah, I can see why cowards go first. This weekend, those of us who follow Christ celebrate that we serve a God who did not turn tail and run when his very human flesh was being excruciatingly tortured by sins he never participated in, a God who commands us to be strong in the power of His might, a God who assures us that His strength is made perfect in our weakness, a God who acknowledges we who fight alongside Him will face tribulation but that no weapon formed against us can prosper. We serve a God who loves us all–even if we’re scared of moths–but whose kingdom has no room for, makes no allowances for cowards. Thank God Jesus didn’t. Really. Thank Him. And have a most courageous Resurrection Day! But the cowardly…Now that chills me to the core. Those three words used to frighten and confuse me. I didn’t understand why “the cowardly” are not only on the list of the so-called serious sinners to be consigned to a fiery second death, but are listed first. After a few decades of witnessing how cowardliness destroys everything from families to countries, I understand. Cowards see disagreements as attacks. All conflicts, even necessary ones, are a threat to be silenced at any cost. Cowards hate truth and despise boundaries, but blithely tolerate injustice and brutality against others lest the attack be launched on them. Cowards bail when things get tough with no thought for those whom their desertion makes things even tougher. Cowards are the ultimate betrayers. Watched any good debates lately? Read any impassioned articles about the state of our tragically-divided union? Had any stirring convos about glass ceilings or the Peter principle or micromanagement or lip service? Leadership is on our minds a lot, yes? You know what’s not on our minds much? 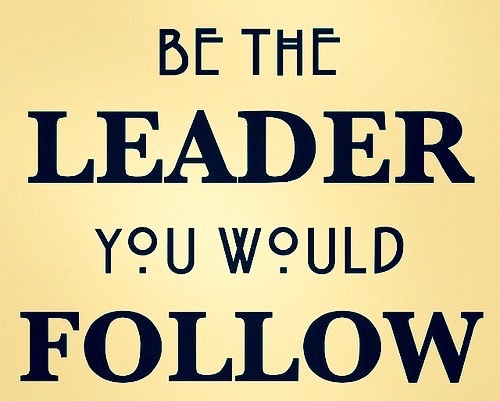 Followership, or the art of being a good follower. Don’t ask me, ask Google. There are thousands of articles on leadership, on how to be a good leader, on how to recognize a bad one, yada, yada, yada. Not so much on being a follower. And the few hundred “follower” articles out there don’t seem to be getting much traffic (kind of like this blog). 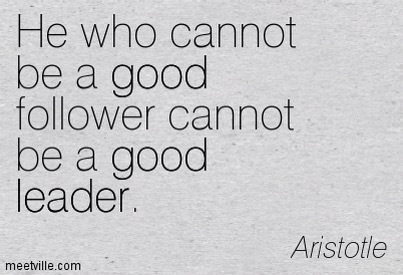 I’m going to participate in the futility: Instead of a top 7 or 10 or 20 list of qualities of a good leader, here are a mere five qualities of a good follower. 1) Pray for your leaders. All of them. Even the ones who won’t know your name unless you screw something up. Even the condescending ones. Even the control freak/micro-managing ones. Even the hopelessly-in-over-their-heads ones. Especially them. I also refuse to speak ill of a sitting president. I try to assume of pastors and presidents what I hope others assume of me: No matter what I’ve heard, I don’t have the full picture, I don’t know all the facts, and I probably couldn’t do any better. My role is to stay in my lane and pray. This is no basic, perfunctory suggestion. And it’s not easy. Praying for people in power–really praying for them–is hard work. What’s easy is getting fed up with, disgusted over, outraged at what passes for leadership at times. But leaders are people, and people are flawed, sometimes fatally so. Ironically, my commitment to pray for the leadership of my church led to a test of that very commitment. I’ll skip the details, but I was blindsided by a situation that left me discouraged. I could have gotten offended; I could have given up. I chose to let it go and keep praying. It was worth it. After years of repeatedly wrestling my arrogance to the mat, I finally understand that while I may not agree with or appreciate every decision my leaders make, they don’t answer to me. Surprising, huh? My commentary on them–and I can so do commentary–is never rewarded, but my prayer for them is. 2) Listen to your leaders. Really listen. I teach at a high school, so I explain, instruct, admonish, and monitor young people a minimum of seven hours a day. Much of that time is spent repeating perfectly clear instructions to kids who practice tuning out. Unfortunately, that is not just a kid problem. We can all be selective listeners, and many of us are more distracted than ever. This can be maddening for leaders, who have the challenging task of disseminating information to people of varying degrees of comprehension. It’s exhausting to have to repeat information to folks who require individual attention because of their inattentiveness, and a leader’s job is already demanding enough. Church leaders have the particularly frustrating, entirely too frequent task of having to leave the 99 to go after the one who has wandered because he wasn’t paying attention. “He that has ears, let him hear”…please. We need to help our leaders preserve their energy for leading the herd to greener pastures, rather than expending it explaining/restating every basic command. 3) Emulate your leader’s good qualities. That doesn’t mean to mimic a leader’s behavior. Imitation may be the sincerest form of flattery but it’s still flattery, which is false…and creepy. Observe how your leaders treat people, how they handle conflict, how they inspire others, how they manage the work space, how they delegate, how receptive they are to input, how they handle mistakes, how they solve problems, how they manage resources, how fair they are, how encouraging they are, how willing they are to give praise/admit fault/make changes, how organized/knowledgable/optimistic they are. Finding in your leaders strengths you lack and striving to make those part of your character is a compliment to them and an asset to you. 4) Work alongside your leaders. In other words, even as your leader has set aside his/her personal agenda for what’s best for the organization, so must you set aside yours. Even as your leader has shouldered the cross he was called to bear, so must you shoulder yours. Even as your leader is walking the path plotted out for him, so must you walk yours. The world has enough wannabes. There are plenty of Monday-morning quarterbacks making calls from thread-bare recliners. The cheap seats are full of folks hoping to see a little action. What our leaders need are people who will work alongside them. 5) Communicate kindly and honestly with them. Newsflash: Leaders do not have superpowers. They do not read minds. They do not have the time or the energy or the wherewithal to predict every crisis an organization may face, to know how every change will affect the bottom line, the stakeholders, or you. They do not have all the answers. And they do not have a special dispensation from God that makes them impervious to rudeness or gossip or fatigue or frustration. Frequent whining, complaining, and trash talking is bad form for followers, whereas meaningful input is a godsend to a good leader. Ideally, a leader would expect, even invite, his/her followers to communicate openly about matters essential to the organization. The key word there is ideally. If followers aren’t encouraged to give input, the temptation may be to remain frustrated and disgruntledled, to never approach leadership with a legitimate question, concern, or suggestion for fear of an unpleasant response. That happens. Do it anyway. If those in the trenches know there’s an issue that can hurt the organization, they have an obligation to thoughtfully and humbly bring the concern to leadership, whatever the consequences. If you “speak the truth in love” but you’re treated rudely, you aren’t heard, you end up with a target on your back or a price on your head, and if your ability to be a faithful follower after that failed attempt becomes questionable at best, leave. Seriously. But first, see #1. I learned a lot from my students that year. The things they were dealing with at home were often far from good, and there was little they could do but roll with the punches. In solidarity with them, I learned to say “it’s all good” even when it wasn’t good at all. Judge me: I laughed. Felix laughed. The whole class laughed. Then we apologized to the frustrated teacher on the other side of the ply board wall and went on to cover a good bit of grammar sprinkled with shared-joke giggles. It had started off rocky, but that turned out to be a good day. Good is one of those words like love and blessed and awesome that people use too liberally to take very seriously. We talk about good people, good jobs, good gravy (why do people struggle with this? gravy is easy; biscuits are hard). We say good luck, good riddance, good grief, and, yes, it’s all good. And it is all good. Except when it’s not. That tree looked good and was good for food, but it wasn’t good for man to eat it any more than it was good for him to be alone. Except that whole not being alone thing came back to bite him–pun intended–that day. Eve’s purpose and position as co-laborer and co-steward were good. But she listened to a good speech, desired what appeared to be a good thing, and made a good case for her husband to taste and see with her. And so he did. That was not good. Well, if they weren’t supposed to eat that fruit, what on earth–literally–was it good for? The tree of knowledge of good and evil was part of the “very good” creation. Since ugly and yucky weren’t things yet, it carried with it no evidence of its negative consequences. Even the consequences themselves may have been nearly impossible for its potential victims to grasp until it was too late. Which doesn’t seem fair. Sort of like it’s not fair that ice cream looks and tastes fantastic. There is nothing in that sweet, creamy goodness loaded with delightful surprises and covered in tantalizing toppings that indicates its consequence is ill-fitting clothing. Wouldn’t it be good if stuff that was bad for us tasted bad and the stuff that was good for us–like exercise and honesty and praying for our enemies–was easy? Actually, no. Part of what makes something good is that we get to choose it. Or not. Because some of the stuff that’s bad for us does taste, smell, feel bad, and we partake of it anyway. Because we are not always good at making wise decisions whatever the warning…says every tobacco user, heavy drinker, fast-food lover, thrill seeker everywhere. Because we are too fickle and subjective to be trusted with assigning value to things based on our flawed perceptions, which can be vastly different from other people’s perceptions. Like, there are ACTUAL PEOPLE who do not like ice cream! What the what?! Because dominion, aka stewardship, requires decisions that aren’t based on personal, often superficial preferences. Because God commanded. There’s the answer. To be his stewards, we have to follow his instructions, heed his commands. Which means there has to be something about which he must instruct or command us that requires we choose his will over our desire. Just as a toddler has no concept of gravity and its effect on his body, and teenagers have no concept of physics and its effect on the 3000 lb death machines they try to drift across a wet parking lot, Adam and Eve had no concept of the huge chasm between the good they had and the evil they had not yet encountered. And they had no concept of death. They’d had the opportunity to “taste and see” that He was good. They’d had the chance to choose obedience over personal preference. They’d heard him say, “Everything is good, but not everything is beneficial.” Well, sort of. Actually, Paul said something like that in his first letter to the Corinthians because some of the folks in the early church were channeling the 21st century and were all like “you can’t judge me!” and “I’ve got my rights!” and “screw legalism!” Okay, not in those exact words. And Paul was all like, “No one should seek his own good, but the good of others” (1 Corinthians‬ ‭10:23-24), which was as hard to do then as it is now. But it’s good. “There is a way that appears to be right, but in the end it leads to death.” The Bible. “All that glisters [glitters] is not gold.” Not the Bible. Shakespeare, et al. Merchant of Venice. About, of all things, a beautiful girl and a coffin. If this prince named Morocco wanted Portia, he had to choose the right coffin–gold, silver, or lead–based on their cryptic inscriptions. The message within his choice would determine his fate. He picked the gold one, because, hello, GOLD. And he was sure its promise of “what many men desire” meant he’d get the girl. And the fortune. Especially the fortune. He was wrong. The message concealed in the golden coffin was this: “All the glisters is not gold–Often you have heard that told. Many a man his life hath sold but my outside to behold. Gilded tombs do worms enfold. Had you been as wise as bold…your answer had not been inscrolled” etc, etc, bye, Felicia–I mean, Morocco. If Morocco hadn’t been a shallow, self-centered jerk seeking his own “good” rather than what was good for Portia, he would have recognized which inscription led to the prize. But he didn’t have the good sense to choose the plain lead coffin that on the outside read “Who chooseth me must give and hazard all he hath” and on the inside offered him the best of the kingdom. You see, what those kids in my first classroom taught me is that it’s all good even when it’s not. Sometimes it’s ugly and confusing. Sometimes it’s aggravating and exhausting. Sometimes it’s just plain dumb. But if we resist the urge to give in to our restlessness and recklessness, there remains a reward. For them it was the ability to shake off the small stuff and to laugh when that wasn’t the easiest option. Rude, from the Latin meaning “unwrought,” as in “not in a finished condition.” Also from the Old French meaning “broken stone”…think sharp rock. Ever step on a sharp rock? OUCH! The way it just digs into those tender spots! The nerves in your feet will not soon forget that offense, just as your nerves may still jangle at the memory of being treated rudely. Some digs just stick with you. And God challenge us–all of us–to see ourselves as clearly as He does and to hold ourselves as accountable as we’d ever hold our rudest acquaintance. Because there are enough jerks in the world, Church. We ought to be ashamed of being in league with them. And I know to some of you that sounds rude, but that was no broken stone that hit a nerve. That was a smooth one that found its mark. 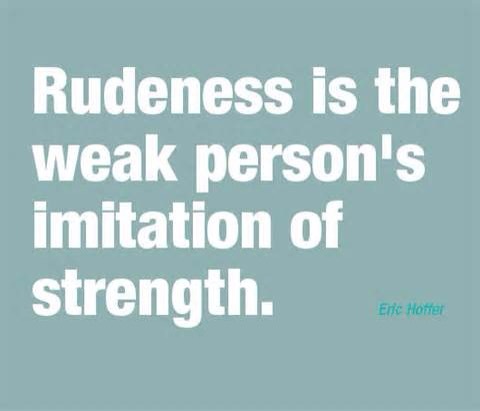 We must learn the difference between a rude confrontation and a loving one. Now. Today. For Christ’s sake…literally. ***If I’ve ever offended you and you still struggle with feelings of disgust or rage or just general annoyance, let’s talk. In case you’ve missed the headlines, cursing is more in vogue than ever. Lots of people, including Christians (and, er, a certain politician favored by some of the evangelical bunch) are becoming more comfortable with using crude terms in public. For the record, I have no stones to throw. For those less open to the practice, acronyms have become a way of cursing without being offensive. By cramming our crude, angry outbursts into these cryptic forms, we eliminate overt vulgarity in favor of implied vulgarity. Does that make it less vile? Maybe not. But that’s not exactly what I want to talk about. In Paul’s letter to the Ephesians, we find the admonition to “let no unclean communication” come out of our mouths but to only say “that which is helpful in building others up, so it may edify the body.” This text is often cited in reference to gratuitous cursing, but it is much, much more significant than that. That’s what I want to talk about. Whether we spell it out, use its initials, or convey it with a certain tone, there are all kinds of ways to play dirty with words. While there’s no doubt that definition applies to so-called foul language, it also applies to everyday language that has become fair game even for the church crowd, things like gossip, flattery, lies, slander, derision, bitterness, fault-finding, and a host of other types of speech that are designed to steal, kill, and destroy our effectiveness against all kinds of bad stuff. I mean, the culture has come a long way since the sticks and stones and all that words-don’t-hurt nonsense, but the idea that our own words can make us weak and worthless in the trenches of life’s battles is a little hard to swallow, no? I teach high school English. Many of my young students have very little appreciation for the nuances of modern grammar, the dynamism of the written word, the universality of the human condition as evident in story-telling. But they have words. Lots of them. Their gift of speech is often spent on carnal things: criticizing, complaining, mocking, bullying. In these instances, shallowness and self-centeredness drive their desire to make the classroom atmosphere, shall we say, more compatible with their preferences. They gleefully use their words to fire things up a bit. Fortunately, I am not without the resources I need to end the carnage, only my weapons aren’t carnal but are, according to one expert, mighty. So what do I do when classroom shenanigans become real WTH moments, as in WTH is wrong with these kids?! Frustration with people who won’t listen and learn is a given. Even Jesus acknowledged it. But fouling up our power source–the tongue–with poorly-chosen, putrid words is just dumb, as in not smart but also as in hit-the-mute-button-on-this-nutcase. Of course, I can always WTH my way into a teacher’s lounge and practice my default response to aggravation: I can complain bitterly to whoever will listen until my voice is hoarse and their ears are cauliflower-ed. By the time I run out of expletives, I’ll have stirred up the hornets’ nest of ugly feelings that seems to lurk right below the surface of my shallow gratitude. Phew, phew, peeee-ew. Definitely down. Or I can do this. I can remind myself exactly WTH has gotten into people and determine to love the H out of them. I can choose my words carefully, especially when I deliver correction. I can be a presence, not a threat, to those who need extra, uh, attention. I can offer help to those who are struggling. I can encourage those who are doing well. I can teach my young friends how to use their words. I can exercise the authority that humility and wisdom entitle me to. I can do those things. And sometimes I do. But sometimes I just want people to leave me the H alone. Sometimes, I try–and fail–to beat the H out of people with my vocabulary because I’m H-bent to win some verbal battle even though that’s not anywhere in the overcome-the-world clause of my commitment. Exactly. WTH gets into me. WTH is wrong with me. And it’s probably wrong with you too. So what in God’s name do we do about it? 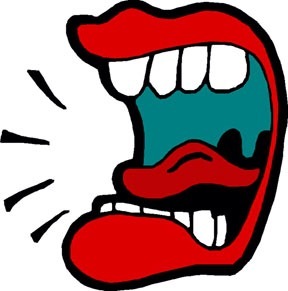 Then we have to get the H out of there, as in, rid ourselves of “anger, rage, malice, slander, and filthy language….” (Colossians 3:8) so that what comes out of our mouths isn’t a load of rot. If you’re a control freak/micro-manager/passive-aggressive manipulator, you’re not going to want to read this blog…but you probably will. Because–to turn those old Carly Simon lyrics a bit–you probably think this isn’t about you. But it kinda is. Control “freakness” over laundry procedures or kitchen arrangement is fairly harmless, as long as it’s in your domain and not your neighbor’s/sister’s/random stranger’s domain. It’s when you project your preferences–overtly or passive-aggressively–into a shared space or someone else’s life that the line is crossed. For Christians, the desire to exercise control over people or situations within the context of our fellowship is downright ungodly, as we are commanded that to be first we must be last, that we are to “work together with one mind and purpose…to be humble and think of others as better” than ourselves, to “have the same attitude Christ had” in giving up his “divine privileges” (Philippians 2). In other words, just because I can assert my preferences or orchestrate things to go my way doesn’t mean I should. In fact, perhaps the more compelling my desire to exercise control in an area–even in the context of leadership–the more I should probably resist the urge to do so. And for good reason. Much of what we call “control” is an illusion. Case in point: Pedestrians in NYC still hit traffic light buttons that haven’t worked in decades (everything is done by computers now) because they THINK it helps them obtain the right of way faster. That’s a telling, albeit harmless, illusion that reveals our need to feel like we control our everyday experiences, something that can motivate us to take responsibility for our choices but can also frustrate us to distraction when things don’t go according to some well-orchestrated plan of ours. Less harmless is the delusion that we can be in control of areas that defy human intervention as that delusion causes its victims to believe they are unusually gifted or superior to others. For instance, some people who win the lottery attribute the luck to their ability to play the odds and refuse to entertain any other explanation. A more high-stakes example of this delusion was identified in a study on financial markets that found traders who believe they have the greatest control over the markets actually perform the worst in those markets (“The Illusion of Control: Are There Benefits to Being Self-Deluded?” PSYBLOG spring.org.uk). Why this overestimation of their abilites? Perhaps because this kind of grandiose self-delusion prevents people from seeking or accepting constructive criticism. The more a person believes he is in control, the stronger the delusion of control becomes, and the more likely he is to ignore the signs that things aren’t going so great. People who are controlling avoid or reject confrontation. They resist collaboration. And they are difficult to be friends with because controlling people are consumed with a desire to dominate and find it difficult to defer to others, even in minor matters. By definition, control “prevents the flourishing of,” which is great if you’re talking about weeds but devastating if you’re talking about relationships. Of course, there are areas where we do have considerable control. Ironically, the higher the level of our actual control over a situation, the more likely we are to underestimate it. This is known as the “illusion of futility” by psychologists. The rest of us call it “making excuses” and we are all guilty of it at times. Whatever my excuse, controlling what I eat and how often I exercise keeps me healthier, controlling my speed and attentiveness in a vehicle keeps me and others safer, and controlling my tendency to be a control freak makes my relationships much more pleasant and fruitful. Because the fruit of the Spirit is love not lockstep, joy not judgement, peace not pettiness, patience not pessimism, kindness not condemnation, goodness not goading, faithfulness not foolishness, gentleness not grievousness, and self-control not self-aggrandizement. 1 Peter 4:7-8 The end of all things is near. Therefore be self-controlled and sober-minded so that you may pray. 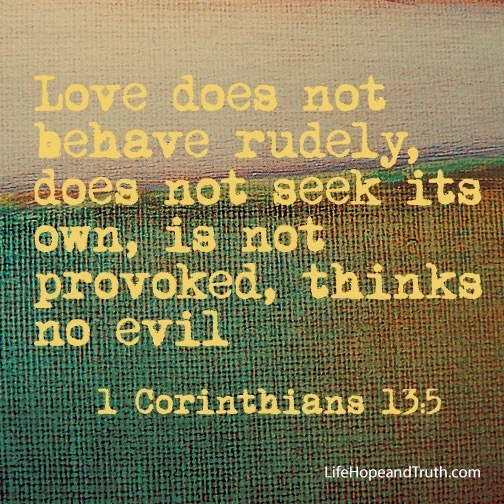 Above all, love each other deeply because love covers a multitude of sins.